During Lent, Guardian Angels Parish will also have Stations of the Cross every Friday night in the church beginning at 7:00pm. Join us for a fish fry dinner on Fridays throughout Lent. We will have three speakers on consecutive Tuesdays in March. Guardian Angels Parish will hold Masses for Ash Wednesday at 7:30am, 9:00am, and 7:15pm. GA Parishioners can gain access to books, videos, etc. through FORMED.org. Come learn more about the 56th production of Guardian Angels Follies! Join us December 10th for a discussion about the most important of God's gifts: His mercy. Join us November 12th for a presentation by Robert Rogers about Being Thankful in All Things. Next training session scheduled for November 8th. 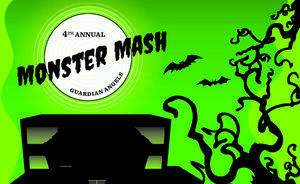 Come join the Halloween fun at the 4th annual Monster Mash . This is a family fun event complete with food, drinks, music, photo booth and treats. There will be a Costume and Carved Pumpkin Contest.